The deaths of NYPD officers Rafael Ramos and Wenjian Liu, gunned down by a mentally unstable man who later committed suicide, have been accompanied by public rituals of mourning. Unfortunately, many public figures are also villifying those who demand accountabilty for police brutality. In a sign of how debased American cultural values have become (especially on the Right), a plea for human dignity, civil rights and an end to police brutality against people of color can be twisted and warped into some type of provocation to violence against the police. The millions of Americans who want police to act in a professional and responsible manner by not abusing those they are ostensibly “sworn to protect” are not endorsing premeditated violence against police. Rather, those Americans of conscience who are standing up against police brutality believe that the dignity and safety of all people are paramount virtues. While it may be a challenging truth for some, as I wrote here, the lives of Rafael Ramos and Wenjian Liu are no more valuable or sacred than the lives of Eric Garner, Tamir Rice, Michael Brown, John Crawford, or any other human being. Human rights are universal. The lives of police are no more valuable or special than those of any other citizen. Failing to embrace this fact leads to a type of creeping fascism or authoritarianism by legitimizing police thuggery and abuse of the public. While the public rituals that accompany the loss of a police officer are by definition designed to hide and obfuscate complex realities through the use of powerful symbols and rhetoric, the basic truth remains that police as a social institution and group are not victims. Rather, in the United States the police are a protected class of people. They are the day-to-day face of the State—and its power to visit violence upon the American people. 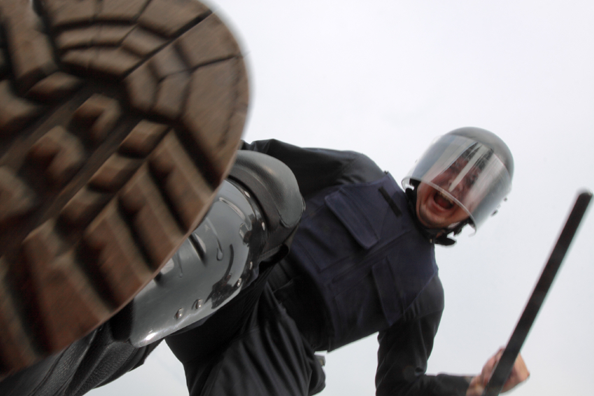 Police are enforcers of the law; in many ways they are positioned above and outside it. The examples of this Orwellian abuse of power are many. The Supreme Court recently ruled in Hein v. North Carolina that even when a police officer stops a person without proper cause such an act is not a violation of the Constitution’s protections against unreasonable search and seizure. And in those rare instances when police are faced with indictments by the courts for their illegal, hostile and heinous acts against the American people they are rarely, if ever, indicted. Police departments also do not report the actual numbers of people they kill in the United States each year. Victims of police violence are “disappeared” by a bureaucratic trick where “justified” killings by police officers are thrown down the memory hole. The criminal justice system monitors itself. There can be no true accountability. This is not an accident or aberration of the system. No, it is the carceral and punishing State working exactly as designed and intended by American elites. The United States was founded as a white (and male) supremacist society. Centuries later, the country remains organized around the maintenance and protection of white privilege. These hierarchies of race deem that the ability and power of the police to violate the basic human and Constitutional rights of a given person of color in the United States are outsized and exaggerated. Here, police abuse against non-whites (and the poor, more generally) within the context of a racist criminal justice system (what Michelle Alexander has called the New Jim Crow) is the norm, a quotidian reality that hides behind cold statistics that detail how black teens are 21 times more likely to be killed by the police than their white peers, or how a black person’s life is taken at least once every 28 hours by a law enforcement officer. The panoply of ways black and brown people have been killed by the police, and the explanations offered for their deaths, could form the basis of an absurdist or dark satire. Black people have been killed by cops for sleeping in cars, because wallets, key chains and cell phones look like guns when held by African Americans; for holding toys, committing the Jim Crow-era crime of “bumptious walking,” playing in the park, dressing up like a favorite anime character, or selling loose cigarettes outside a corner bodega. Except for pathological white racists, and those other white folks who share such sentiments and feelings even while they mask their bigotry with the claim that they don’t "see" race, there is no humor to be found in this necropolis of black people, many of them unarmed, who have been killed by the police in this bloody 2014 or in the decades and centuries that preceded it. Because the police are a protected class, an artifice of myths has been erected around them, myths that take the form of unstated assumptions that are circulated throughout American culture and are rarely questioned or critically interrogated. This cultural and rhetorical shield takes many forms; it is a narrative and type of conventional wisdom that Americans learn in childhood, is recited by politicians and religious leaders, and endlessly reinforced by the mass media. Police violence is justified and explained away by the following tropes. Police work is a dangerous job. While being a police officer may involve some level of risk, it is largely mitigated by training and equipment. On the macro level, in the United Statespolice work is not included in the top 10 most dangerous professions. Sanitation workers, truck drivers, forestry workers, and professional fisherman are far more likely to be killed or injured on the job than police. While the mass media and police unions are invested in projecting an image of police work as highly dangerous, thrilling, and adrenaline-filled, the number-one cause of death for police officers are vehicular accidents. Police have a difficult job that involves making split-second decisions. As research on implicit bias, racism and police use of force has demonstrated, cops are much more likely to make “split-second decisions” to kill black men. Yet, somehow the perils and fears that loom over police and their decision-making processes are suspended and lessened when they interact with white people. Cliven Bundy and his armed group of marauders did not face a “split-second” decision by the police to shoot them. White men walking around neighborhoods with guns displayed in plain sight are not preemptively killed by the police. White men who have actually shot at firefighters and police are somehow miraculously taken into custody unharmed and alive. White teenagers who bring arsenals of guns and knives to their high schools are arrested and given bail. Police selectively make split-second decisions about who to shoot and kill in America. Blackness is a trigger for violence; whiteness and white skin privilege are signals to deescalate. Police are heroes. Heroism involves a selfless act by a person who is not trained for such duty, or who cannot be reasonably expected to act in such a manner. Police have chosen their profession. They are trained and equipped for the task. Police officers are also well compensated both on the job and in retirement. They also benefit and receive support from a huge and powerful social apparatus that is designed to protect them from the consequences of their actions. A given police officer may have a moment of bravery or courage. By themselves, neither of those deeds rises to the level of heroism. The police who killed Eric Garner, Tamir Rice, Michael Brown, and who participate in a system that harasses and targets people of color for unjust punishment and harassment are most certainly not heroes in the best and most authentic sense of the word. Instead of holding police (and others who are empowered by the state to kill) to a higher standard, America’s civil religion deifies police and simultaneously lowers their bar of accountability to one far below that of the average person—in all, what is a perverse paradox. The blind worship of the police exists in the same flat and empty right-wing political imagination as litmus tests for patriotism that consist of questioning if a given politician wears an American flag pen on his lapel. Such rituals socialize the American people into the twin habits of banal and unreflective thinking which legitimizes a narrowing of the public discourse. Basic questions about justice are made verboten; they are not to be mentioned or discussed in polite company. Rafael Ramos and Wenjian Liu are dead. Eric Garner, and many other unarmed black and brown people are also dead—killed by the police under highly questionable circumstances. Demands that police treat all Americans with respect, and in accordance with their human rights, is not a zero sum game. Police lives matter because they are human beings. The lives of the victims of police brutality and violence matter because they too are human beings. This simple calculus makes for a safer and more just society for all people. I think the more the right blames protesting citizens for the two police murders the more ridiculous it looks. This exposes the astro roots of the right. It can't completely dupe the public so it fabricates an alternate fascist reality hoping that it will be self fulfilling. You are assuming their public is grounded in the same reality as normal, ethical, and thinking people are...the white right lives in a fantasy land where in keeping with the paranoid style in American politics the more absurd their opinion leaders are the more the mouth breathers on the Right are ginned up by their icons and heads of the cult. Was this your piece over at Alternet? Martinsburg is a small city nearby. In 2013, 5 police shot a man 23 times. Some in the back. They say one of their officers was stabbed by the man. Martinsburg sent some officers to the funeral in New York City. They said they were surprised at the amount of support for police. I'm glad to hear someone is taking up the above case. I thought I heard about it when it happened, but when I researched it I found nothing. There is a local college radio station and I heard a normally bad talk show talking about it one morning. I was in disbelief. Here? 23 shots? 5 officers? tased, beat and shot to death. It's in our nation's blood, like lynching, slavery, economic exploitation, and endless war fetishism. I overstated the case but still there is a huge gap between morality and intelligence that the right rationalizes and goebbelizes to make the two poles jibe but I think most folks reflexively know that they're full of it.